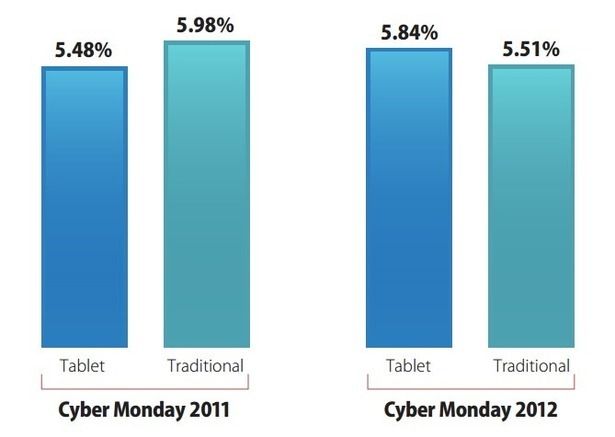 Tablets had higher conversion rate than desktops on Cyber Monday 2012! According to the data from monetate, on Cyber Monday 2012, for the first time in history average conversion rate from a tablet visitor was higher than the conversion rate of a desktop visitor! This amazing shift we’re seeing in both volume of tablet traffic on online stores, and increasing quality of the tablet visitors experience is a direct result of better – tablet optimized websites, and newer, faster and better tablets on the market. If this trend continues, average consumer will eventually buy almost everything through a tablet or a mobile device and desktop visitors will become negligible for most of the online stores.